On a day when most are rejoicing in holiday spirits, Christmas Eve turned fateful for former Texas Rangers pitcher John Barfield. 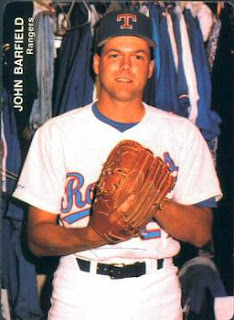 The 52-year-old Barfield, who pitched in parts of three seasons for the Rangers from 1989-1991, was murdered at his home in Little Rock, Arkansas after engaging in a dispute with an acquaintance. Barfield, whose Rangers moundmates included Hall of Famers Goose Gossage and Nolan Ryan, compiled an 8-8 record with a 4.72 ERA in 65 career appearances. According to a statement from the Rangers, Barfield's August 18th, 1990 six-inning relief victory was the last relief victory of 5.1 or more innings, until Diego Moreno accomplished the feat for the Yankees in 2015.